Léon: The Professional, the film that launched director Luc Besson into an international renown, came out a quarter-century ago this year. And in this case, “international renown” means he became known outside his native France not just in America but all over the world, and especially here in South Korea. Or rather, Besson the filmmaker has become less a household name in this country than Léonthe film has, and its name now seems known to more Korean households than ever. Most cellphone accessory shops stock Léon-themed cases, and as soon as I snapped one on my phone, everyone I encountered stopped commenting on its age — few Koreans today would be caught dead with an iPhone 5S — and started commenting on how much they love the movie the image on its back came from. All this over a 25-year-old French hitman picture. The range of Léon merchandise available on the streets of Seoul — none officially licensed, naturally — hardly stops at cellphone cases: shirts emblazoned with drawings of Jean Reno’s rough-edged but ascetic assassin-for-hire and Natalie Portman’s smokingly, swearingly precocious orphan spill out of every other university-proximate clothing store. 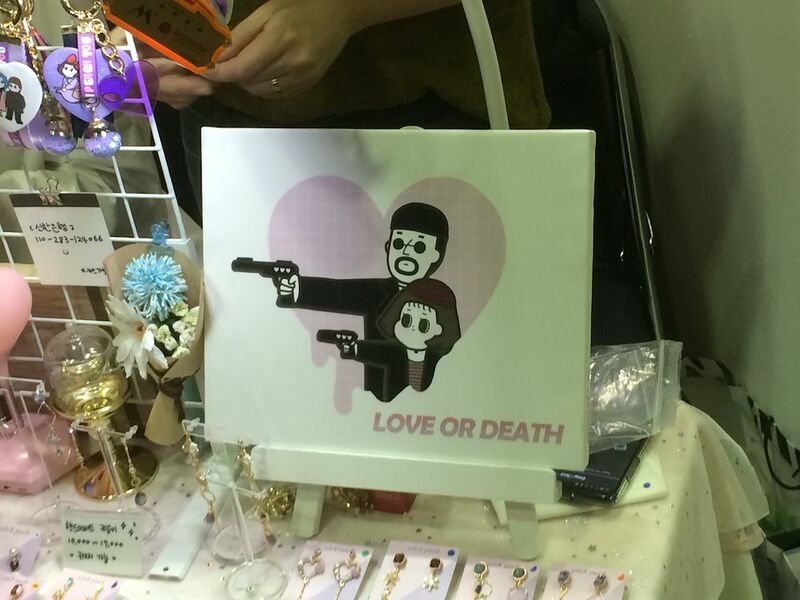 At the city’s frequent craft fairs young artists have applied their images to an ever-widening array of objects, often accompanied by the words “love or death” from the ultimatum so memorably laid down by Portman’s Mathilda to Reno’s Léon. Unlike London Review of Books tote bags, which last year enjoyed a moment in Korea as aesthetic objects more or less disconnected from their referent, Léon often gets referenced in its content as well, in text as well as on screen. Read the whole thing at the Los Angeles Review of Books. This was written by Colin Marshall. Posted on Monday, February 25, 2019, at 11:49 pm. Filed under Uncategorized. Bookmark the permalink. Follow comments here with the RSS feed. Comments are closed, but you can leave a trackback.